Schedule | Simon Family JCC | Fitness. Family. Fun. For Everyone! Take 30 minutes to unwind tight stiffness! This class will focus on core stabilizing exercises to strengthen your midsection and super charge your daily performance. This mixed variety class with challenge your strength and balance using a variety of body weight exercises and balance equipment that will create a fun, rewarding path to feeling strong and stable. When: JFit Diabetes Prevention Program classes start soon. Tuesday classes start at 11:30 am and Thursday classes start at 5:30 pm. Each class lasts for one hour and continues once per week for 16 weeks, and then once a month for the balance of the year. Info: Change your life in 16 weeks! This program can help you lose weight, adopt healthy habits and significantly reduce your risk of developing type 2 diabetes. Our type 2 diabetes prevention program follows the Center for Disease Control and Prevention guidelines, which are proven to reduce individuals’ risk of developing type 2 diabetes by 58 percent. Simon Family JCC lifestyle coach Tom Purcell will host weekly seminars to help you learn skills and support each other to reduce risk factors. Pick from a wide variety of massages such as sports massages, aromatic massages, and cellulite massages. Prices start at $65 and are performed by Dr. Willita Morring, a leading authority in Hampton Roads on health and wellness. Appointments are available from 10 am to 6 pm Tuesdays and Thursdays. For more information, contact Tom Purcell at 757-321-2310 or tpurcell@simonfamilyjcc.org. 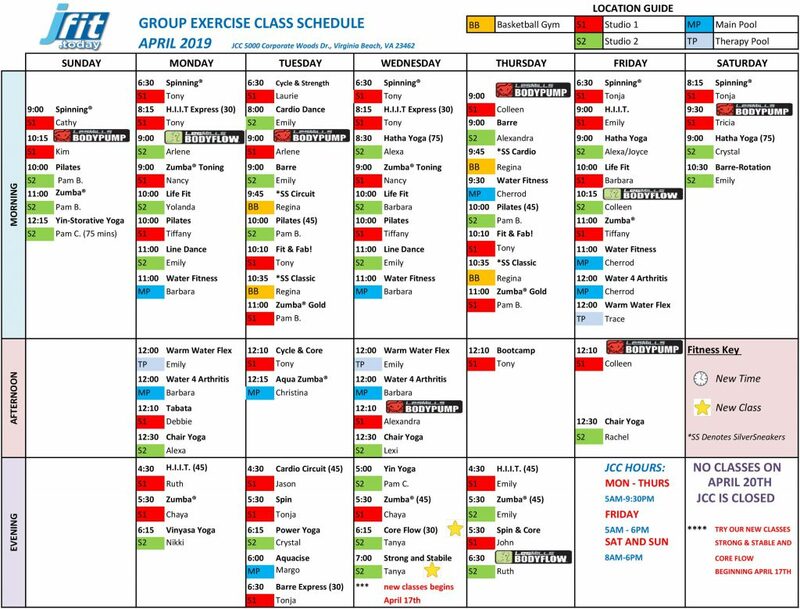 Download the group exercise class schedule here. BODYFLOW® – Fuses yoga, tai chi, and pilates in a workout that builds flexibility, balance, and strength and leaves you feeling centered and calm. Chair Yoga – Using a chair as an extension of your body, you will explore a variety of postures, and breathing techniques. Hatha Yoga – A relatively slow and gentle class. Great for students who prefer a more relaxed style where you hold poses longer. Power Yoga – A combination of strength & balance. You can expect to push yourself to new limits all while focusing on the breath. Tai Chi – A wonderful exercise and martial art that is great for balance and range of motion. Help improve your health and reduce stress while improving aerobic capacity and increasing your energy and stamina. Yin-storative – Blending the perfect mix of Yin and Restorative Yoga, in this 60-minute class suited to all levels. Leave feeling refreshed and restored. Yin Yoga – Slow-paced style in which poses are held for a longer period of time. Increases circulation in the joints & improves flexibility. World Champ Boxing Class with Dorin Spivey – Get in the best shape of your life with World Champion boxer Dorin Spivey. This High Intensity Training group exercise class will build up your agility, strength, and stamina. Using the best practices of boxing and strength training, Dorin will help you develop a lean, strong, and confident physique. All abilities welcome. Limited space is available. For more information, contact Tom Purcell at 757.321.2310 or tpurcell@simonfamilyjcc.org. BODYPUMP™ – Barbell class that will sculpt, tone and strenghten your entire body. Intense training! Core Blast – By working your entire core including your abs, obliques, lower back and deep core stabilizers, this focused 30-minute class will blast your core into shape! H.I.I.T. – This interval-based class combines full-body strength training with high-intensity cardio bursts designed to tone your body and improve your endurance. Modifications for all fitness levels are provided. Tabata – Workout hard for 20 seconds, rest for 10 seconds. Complete 8 rounds for the ultimate Tabata workout. Don’t be afraid to sweat! Barre – A fun, energetic workout that fuses techniques from fitness, dance, pilates and yoga that will tone, define and chisel the whole body. BarreOne – Work on strength, flexibility & balance. Choreographed to current hits, classic Motown, jazz, and classical music, BarreOne strikes the perfect balance of ballet aesthetic and modern fitness techniques. Line Dance – A low impact class, learning different line dances to an eclectic mix of music. Level 1 beginners & level 2 improver. Zumba® – High energy dance class set to latin beats. Zumba® Toning – Same great class using toning sticks. Zumba® Gold – All the elements of a Zumba® Fitness party modified for active older participants. Aquacise – A low to medium impact multi-level water class. Promote joint flexibility, range of motion and agility. Aqua Zumba® – Blends the philosophy of Zumba® with water resistance for a pool party you don’t want to miss. Deep H2O Fitness – Participants should be comfortable in the water. Focus on cardiovascular training & muscle conditioning. Water 4 Arthritis – No swimming ability required. This class provides participants with gentle range of motion exercises. Water Fitness – No swimming ability required. Improves endurance and tones muscles by using the resistance of the water. Warm Water Flex – Held in the therapy pool, this class uses shallow water moves to improve range of motion. Chair Yoga – Using a chair as an extension of your body, you will explore a variety of postures and breathing techniques. Fit & Fab! – Low-impact class offering muscle conditioning, cardio fitness, & fun! Life Fit – A perfect all over workout that will target your entire body, using balls, bands & weights. All abilities welcome! Silver Sneakers® – These classes are specifically designed for older adults who want to improve their strength, cardio fitness, balance & flexibility. Zumba® Gold – All the elements of a Zumba® fitness party modified for active older participants or those new to fitness. Zumba Kids (ages 4+) – High energy rockin’ dance party, packed with kid-friendly routines! Zumba® Kids – This class is a high-energy rockin’ dance party, packed with kid-friendly routines in this 45 minute class. Every Monday and Wednesday at 4:00pm. Kid Fit – Drop your kids to move and have fun, while you workout. Kids 5+ can enjoy fitness activities: Sports, Games & Ninja Warrior Training, to name a few! Monday – Thursday 4pm – 7pm. (2 hour limit). Location varies – see front desk for exact location at time of drop-off. The Zone – The Zone is also available from 3:30-7:30pm for parents to drop their children. Located in main lobby area. All classes are 60 minutes, unless stated in parentheses. i.e Hatha Yoga (75) is noting a 75-minute class. Class time includes set-up and set-down. This allows the class following your sto begin on time. For class questions, please contact Yolanda Muhammad at ymuhammad@simonfamily.jcc.org. Did you know? 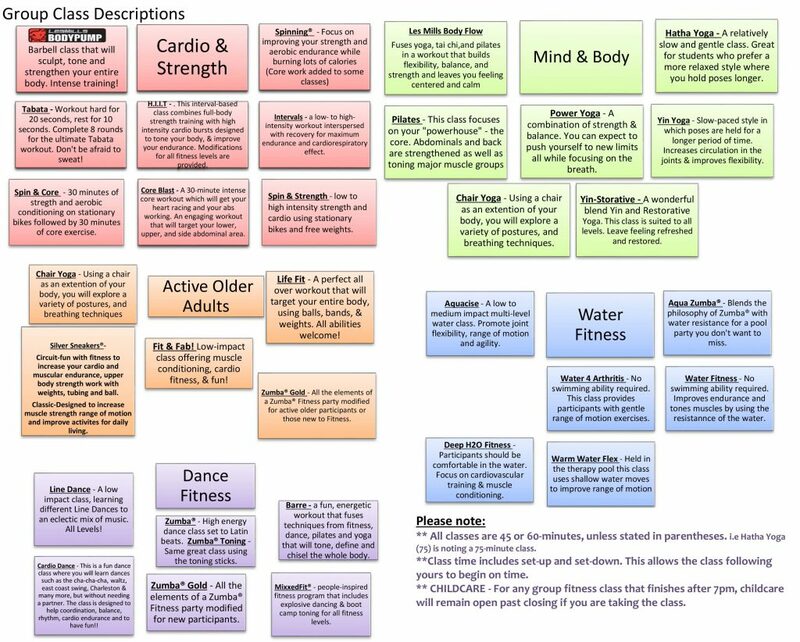 All group classes and children’s activities, listed above, are included in your membership. Non-members are welcome. Drop-in fee just $8 p/day!